"Tender, seasoned beef that can be sliced and served as a sandwich or as an entree. Best to fix day before serving and refrigerate. Makes slicing easier. Delicious!" Pour water into a large kettle, and add bouillon cubes. Mix together the salt, garlic, Italian seasoning, black pepper, oregano, basil, and red pepper flakes on a large plate. Rub roast with 1/2 cup vegetable oil. 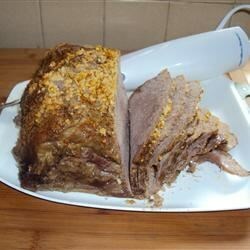 Roll roast in seasoning mixture until well coated. Place the roast in the kettle along with any left over seasoning mixture and oil. Bring water to a boil, reduce heat, and simmer approximately 3 1/2 hours. Meat should be tender and well done. My husband loved this roast sooo much. I made it in a slow cooker @ low setting for 5 hrs. Thanks for the recipe. I must admit I was a bit worried that the spices would be too strong. However, it turned out wonderfully. I baked it in a crock pot on low for about 10 hours and it was so tender!